The Gibson Les Paul is an awesome guitar, but how does it stack up against the SG? The Gibson Les Paul and SG are two of greatest guitars ever made, and some incredible players have slung these instruments over their shoulders through the years. Trying to choose which one is better than the other is no easy task. Of course the choice will come down to several factors specific to you and your needs, but to make the right decision you need to be armed with all the information. In this article we’ll take a look at these two iconic guitars and see what they have in common, and what makes them stand apart. Is one really better than the other when it comes to tone, construction and playability? I’ve been playing guitar for 30 years, so I’ve had a long time to think about this stuff! I also realize not everyone has the budget for a Gibson, so we’ll take a look at the Epiphone versions of these classics too. As you probably know, Epiphone is owned by Gibson, and the only company in the world authorized to make guitars using Gibson’s designs and specs. These are two of the top guitar brands out there, but they compete on very different levels. Speaking of Epiphone, before we begin here’s a quick history lesson. I promise it’s relevant! Back in the old days, Epiphone and Gibson were competitors, and between them they made some of the best guitars on the planet. There was a pretty good guitar player at the time by the name of Les Paul. He built one of the first ever solid-body electric guitars called the “Log” at the Epiphone factory, but Epiphone wanted nothing to do with it. Paul took his design over to Gibson, but they didn’t like it so much either. But when Fender started marketing solid-body guitars in 1950, Gibson enlisted Paul to help them create a new model. This time they put his name on the headstock. The new Gibson Les Paul model was moderately successful at first, but by the late ‘50s it was getting crushed by the Fender Stratocaster in both sales and popularity. So Gibson fiddled with the design, made it lighter and gave it a double-cutaway like the Strat. 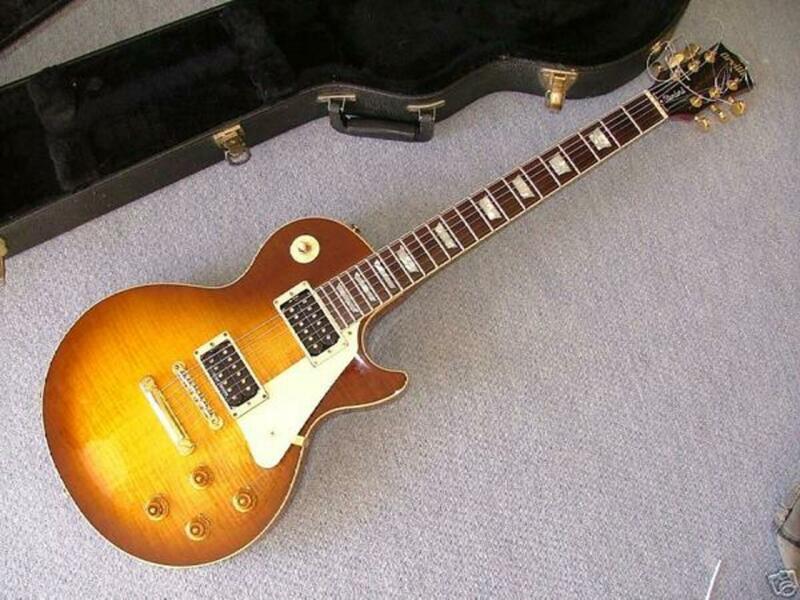 In 1961 a new Gibson Les Paul model was born. Les Paul himself didn’t like it though, and asked to have his name taken off the guitar. So Gibson called it the SG, which stands for “Solid Guitar”. A few years later the original Les Paul design was in demand again. The Les Paul came back strong, but the SG stayed, and by that time Gibson had absorbed Epiphone. And that’s why things are the way they are. Let’s start out by looking at what these guitars have in common. For the sake of simplicity, we’ll compare the modern “Standard” models of each guitar throughout this article. The biggest similarity across the board is the wood, mahogany to be specific. Mahogany is a warm, resonant tonewood with a rich brown color. Both the Les Paul and the SG have mahogany bodies and set mahogany necks. This, combined with the Gibson humbuckers, is what gives both guitars that thick, fat tone that sounds so great through an overdriven amp. 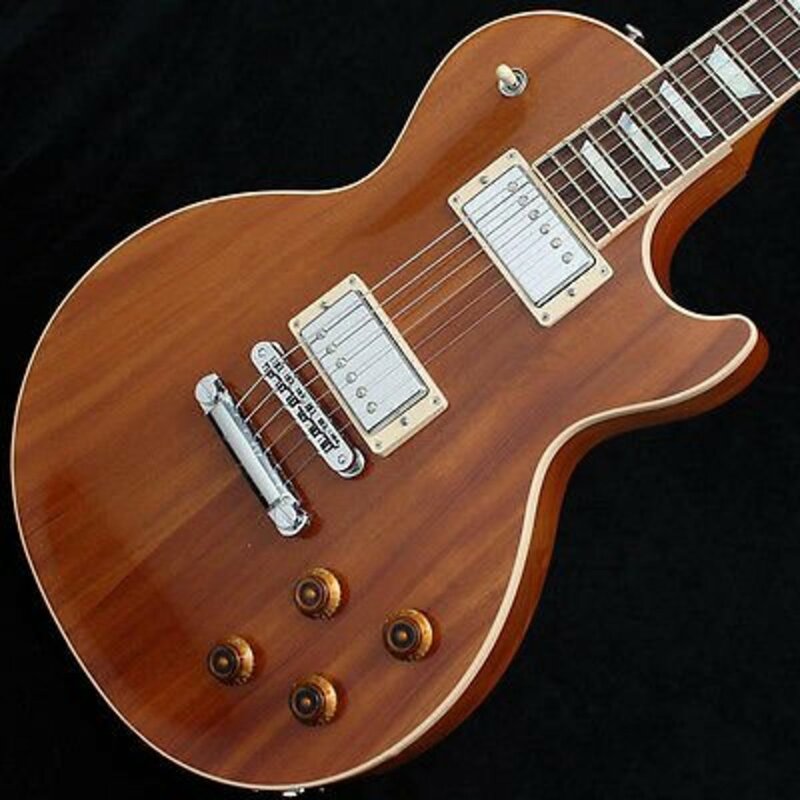 Both models are still incorporating rosewood fingerboard in their designs, though Gibson and other manufacturers are beginning to step up efforts to find alternatives.They also use ebony is some models, such as the Les Paul Custom. The bridge is also similar on both guitars, the classic Tune-o-matic with stop-bar design. Set up correctly, this allows for tremendous tuning stability and sustain. Through the years both guitars have used various bridges on different models. There are even variations of both available with a Floyd Rose, if that’s what you’re into. Both guitars have 3-way pickup switching with separate volume and tone knobs for each pickup. A lot of players like the control this offers compared to guitars that have pickups with shared volume/tone knobs. So what about the differences? Here’s a look at each guitar, and what makes it unique. The Les Paul has stood the test of time over the years, and shines in every genre of music. It has a thicker body than the SG, partly due to the maple cap slapped on top of the mahogany body. The maple helps add a little bite to the resonant mahogany design. And, it looks great through the finish. The size and shape of the body contributes a lot to the Les Paul’s tone, but it also makes the guitar fairly heavy. The single-cut design can limit access to the upper frets for some players with smaller hands, but a slim-taper neck may offer a little relief. Over the years, Gibson has experimented with different ways to make the Les Paul more comfortable, but the bottom line remains: If you want to play a Les Paul, you have to deal with the weight. In recent years Gibson has returned to their roots with the Les Paul Standard. This is in the wake of some interesting ideas over the few years that weren't so well received by some players. You can still get the bells and whistles in the HP version of the Les Paul. The pickups are Burstbucker Pros with coil split. I have these on my Gibson Les Paul Studio Faded, and I like them a lot. They have the depth and clarity most players expect from a Les Paul. Overall, the Les Paul remains one of the best guitars in the world when it comes to tone, craftsmanship and appearance. It’s tough to beat, but it is kind of expensive. Unfortunately, the price tag puts it out of reach for many players. Fortunately, Gibson gives us an affordable option through their Epiphone brand. In this economy it’s sometimes tough to justify spending several thousand dollars on a guitar. Epiphone LPs come in at a fraction of the cost of a Gibson, and they're really good guitars for the money. In fact, in my opinion they are among the top intermediate-level electric guitars in the world. Gibson guitars are made in the USA, where Epiphones are built overseas. This in part accounts for the low cost, though, as we’ll see, there are other reasons. Epis sometimes get a bad rap among the gear snobs out there, but they’re solid guitars made to Gibson’s standards. No, they might not hold up in comparison to a Gibson, but compared to other guitars in their price range they are fantastic. The Epiphone Les Paul Standard PlusTop PRO looks almost as pretty as its Gibson cousin, but there are some key differences in design. One big one, as you can expect, is the wood used. Epiphones are still constructed out of mahogany, but not the select pieces that would be used for a Gibson. Instead of the thick maple cap, they have a maple veneer, which looks great but doesn’t influence the tone in the same way. The Epiphone LP PlusTop PRO is a solid alternative to a Gibson. You'll save a few dollars and still end up with a gorgeous and great-sounding guitar that will do the job onstage or in the studio. There is nothing wrong with dropping big money on a Gibson if you want to, but it's good to know there are other options. But Epiphone Les Pauls have come a long way in recent years, and one big step forward can be seen in the ProBucker pickups used here. These are a significant upgrade from the old Alnico Classics, and while they still don't quite have the bite and clarity of Gibson pickups I think they are pretty darn good. I've been really impressed with every Epiphone LP PRO I've played over the past several years, including the Custom PRO, and I think the gap between Epi and Gibson is closer than ever. The bottom line is, if you want a great Les Paul without dropping a lot of cash the PlusTop PRO is the way to go. It shakes off a lot of the old stigma that used to accompany Epiphone guitars, and has the sound to do the job for any level of player. Back in 1961, the reason for Gibson’s redesign of the Les Paul was to create a guitar that sounded just as good, but eliminated some of the flaws of the original instrument. Of course, now we know those “flaws” are what make the Les Paul sound so great. But the SG didn’t fall short by any stretch of the imagination, and to this day it remains an outstanding option for players who love that thick Les Paul sound, but have some issues with other aspects of the original design. While the SG still has that mahogany body, it’s a thinner piece without the maple top. This makes the guitar lighter, and, along with the flat top (instead of the Les Paul arch top, which was originally more in line with hollow-body guitars) it makes the SG a bit more comfortable for many players. The double-cutaway design allows for easier soloing, but the neck joint is also moved forward to make the upper frets more accessible. Like the Les Paul, the SG Standard. has gotten back to basics in recent years. This is the classic SG look and design, and there a reason it’s stuck around all these years. One more thing worth mentioning about the SG has to do with your wallet. A brand-new Gibson SG Standard will cost about half as much as a new Les Paul Standard. This alone makes the decision for many players. The difference has to do with production techniques, and the added labor involved in the Les Paul’s arch-top design. To you, it might mean you get something like that great Les Paul sound for about half the price. If that's still a little too rich for your blood, you can always look to Epiphone. The Epiphone SG model is called the G-400. Like the Les Paul, it looks an awful lot like a real Gibson at first glance, right down to the inlay on the headstock. But, like the Les Paul, Epiphone will incorporate most cost-effective woods into the G-400 than are used in the SG. Because it’s a simpler design it doesn’t matter quite as much. The Pro model G-400 skips the Gibson pickups for a set of Alnico PRO humbuckers with a coil tap feature. Some players will be happy with their stock Epi while other will look to swap out pickups and other electronics or hardware. In my opinion these pickups are pretty good and I recommend spending some time with them before making a decision. Like the Epi Les Paul, the G-400 is an affordable but still very impressive version of a Gibson classic. Many players prefer the SG for it's looks and playability, not to mention its amazing sound. If that's you, and you're counting your pennies, you might want to consider an Epiphone G-400 PRO. 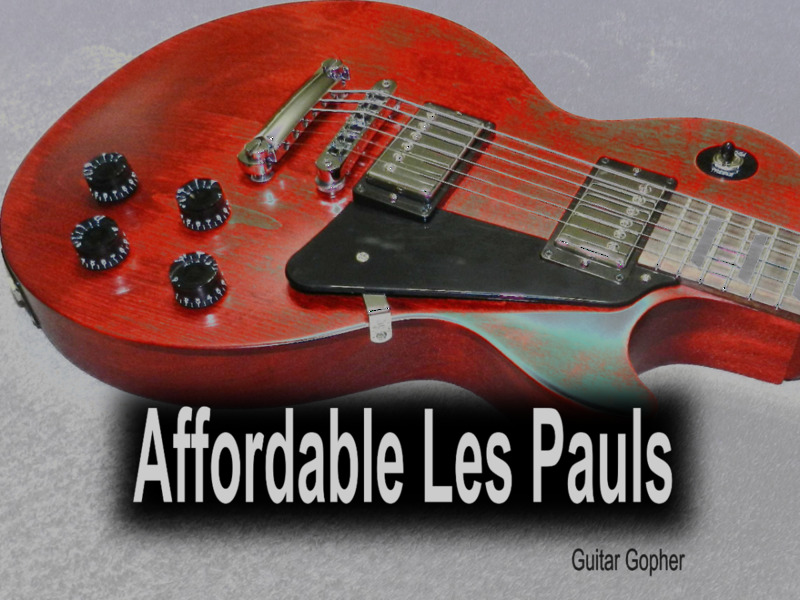 The G-400 is also very affordable, even more so than the Epi Les Paul PRO above. This is guitar good enough to take to the stage or studio, but it still leaves you with a few bucks in your pocket for lunch. Like other Epiphones in this price range, the G-400 PRO has seen improvements like a locking Tune-o-matic bridge and a sturdier output jack. Epiphone has done a great job of addressing many of the quality issues that concerned guitarists in the past, and the Epis of today are more reliable and better sounding that those a decade ago. 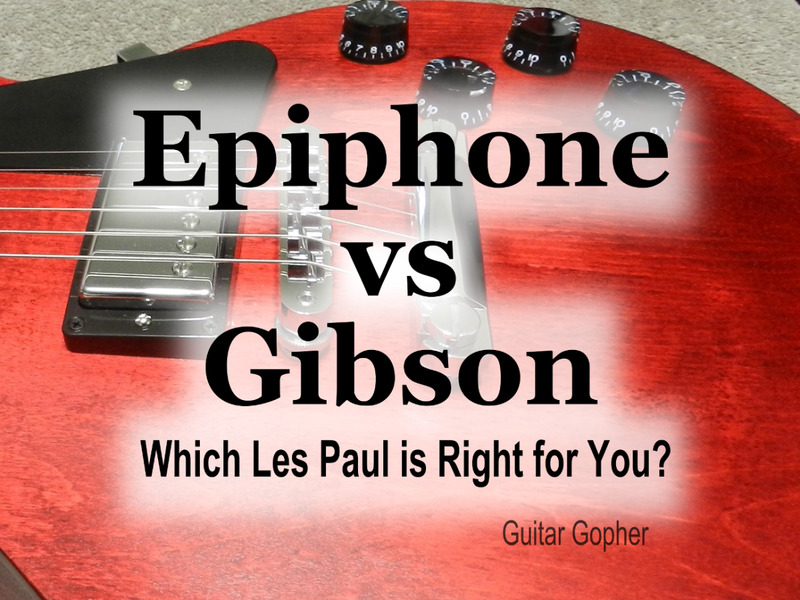 So, is the Epiphone G-400 PRO vs the Gibsons SG a fair comparison? Of course not! But the G-400 is a great guitar for the money, and worthy of serious consideration if you think the SG design is for you. I love the sound and look of the Gibson Les Paul. It’s a classic for a reason, and there is no mistaking that incredible tone. The SG has a similar sound, but maybe not quite as thick. Either way you can't go wrong, and for you it may come down to other factors like body shape and weight. Epiphones are great guitars for the cost and sound better than most other instruments in their price range. It’s just hard to compare them to Gibsons. It’s hard to compare any guitar to a Gibson, so it really isn’t fair. While Epiphones have improved tremendously, the electronics aren’t as good as the Gibson, from pickups to pots and switches, but many experienced players claim by installing better pickups in an Epiphone they end up with something indistinguishable from a real Gibson. The same can be said for the hardware, while both the hardware and electronics are outstanding for a guitar in the price range. Of course many players, even seasoned veterans, see no need to change anything about their Epiphones. If you find the right one, you can land a great guitar for a fraction of the cost you would have spent on the Gibson. I’ve owned a few Epiphones too, and I was very happy with them. If you don’t have the cash for a Gibson, there is absolutely nothing wrong with going the Epiphone route. As for choosing between the SG design and the Les Paul design, well, if your wallet and your back don’t decide for you, it really just comes down to taste. What design do you like better? The decision isn’t easy, but it’s a great problem to have. SG or Les Paul? Which will you choose? I purchased a seriously inexpensive and seldom played 2010 Epiphone Les Paul about 12 months ago. I had it professionally set-up and swapped out the standard pick-ups for a Seymour Duncan 59 (neck)and a Custom 5 (bridge) after taking advice from the Technician about emulating that Gibson tone as closely as possible. Seriously, the guitar was pretty damn good before, now the thing is awesome and played through a decent tube amp, most would not be able to decipher the difference between it and a Gibson LP. It looks and feels fantastic and for me, offers the perfect and justifiable reason not to spend huge $$$ on a Gibson! I’ve had the opportunity to play these guitars back to back to back! I quite like the tone of the original, but when I played them in person I couldn’t really hear or feel much of a difference! In all honesty I kinda liked the Epiphone better! Also the Gibson (which was brand new) had defects in it such as faulty electronics and this was a factory fresh Gibson! So my case currently lies with Epiphone, unless I’m able to play an older les Paul which I hear are better guitars! @K1SFD - I definitely appreciate your comment. I am always paying attention here, and I love when readers offer such insightful opinions on gear. I'm sure it will help someone make a decision.Thank you! In case anyone is still following this post, I figured I'd throw in my $.02! I just recently (6 weeks ago) decided that the Epiphone SG G-400 Pro 1966 edition was the guitar for me. Went to my local GC and fell in love with it. For $399 I got a new absolutely beautiful SG, with splittable Alnico humbuckers. The 66 edition has a beautifully bound fretboard, smooth as silk frets, trapezoid inlays on rosewood, a nice crystal clear sound when wanted, and some filthy dirty tones when pushed. I actually found that the pups were very well matched to my model and didn't have any issues with muddy or missing frequencies out to my practice amp. I am someone who has been a music enthusiast sine picking up the coronet at 7 and played mt way through just about every instrument I could get my hands on. While I don't consider myself a 'tone snob', I am very very demanding on my instruments. Tone, intonation, ability to stay in tune, sustain, and playability are huge to me. Having said that; I would have purchased this over everything bar a Gibson Custom shop SG. The '66 had some serious time, effort, and labor put into it long before it hit the shelves. In case you don't know, Epiphone only reissued this model for a short time and it is now out of production again. If you are looking for one, Guitar Center are some of the few retailers that still have a stock (no, I'm not affiliated with GC, nor am I being paid to promote them). I have the Epiphone "Vintage" G-400. It is about $30 cheaper than the G-400 Pro. It is an amazing guitar, though it has less bells and whistles than the Pro model. The pickups were way too muddy for my tastes, so I threw in a DiMarzio EJ-Custom and SD mini humbucker. Sounds, feels, and looks amazing, custom to my tastes for much less than $500. Hi ddd. The Epiphone Les Paul Standard and G-400 (their rendition of the SG) are not the same. They do utilize the same tonewoods for the body, neck and fingerboard, and the pickups are similar. However, The LP has a thicker, heavier build with an curved top with a single cutaway, where the G-400 is a flat-top, double-cut guitar. So they feel very different to play. The intent of the double-cutaway design is easier access to the upper frets, but honestly I've never had any trouble fretting a Les Paul in the upper registers, so much of that is a matter of style I suppose. These are both good guitars for the price range, of comparable quality and they both sound great, with the LP maybe a little darker and more resonant. Play one of each and go with whatever you like best! Also note that the Epiphone Les Paul PlusTop Pro has different pickups, and in my opinion that makes it head and shoulders over both of these guitars. hi i need to ask something the epiphone sg 400 pro and epiphone les paul standard it's the same guitars to? or not? which of this is better in quality,sound and Convenient in the guitar neck? Almost as good still isn't the best - strongly suggest saving a little extra and going for the Gibson LP. I got a Gibson SGJ 2014 for $490.00 and I like the sound but I think the curve of the body that rests on your thigh when playing seated is a little different from a Les Paul. Maybe that's why it feels like I have to reach out more for the neck when I'm sitting down. Maybe I need a Les Paul, even one of the ones with a flat top. I don't think either one has a body as comfortable as a strat. Hi 98Mockingbird. In that price range, I'd considered the Epi G-400 PRO. Costs about the same as the LP Studio, but it has coil taps for times when you want to back off on the thick humbucker sound. That said, the Epis you are interested in are all-mahogany with set necks and humbuckers, so they are all going to sound somewhat beefy. With the coil taps at least you have an alternative sound. I'm also wondering if you might like something like a Strat with a humbucker. Definitely less beefy, and you'd have a couple of single coils for the country and '50s music you're into. Squier has a the Vintage Modified and Classic Vibe lines which are good guitars in your price range. Good luck! Whatever guitar you end up with , I hope you love it. I'm trying (have tried before) to get into the gibson tone and feel and have owned epiphones and love them. 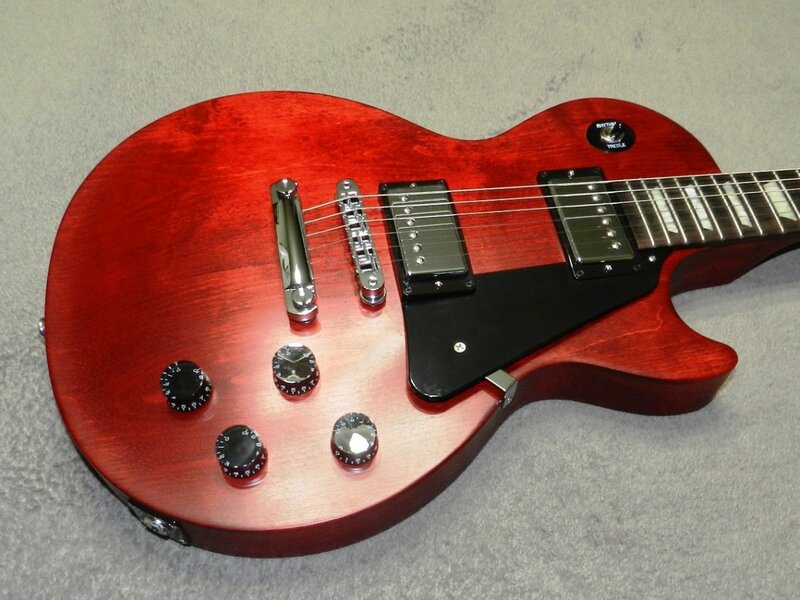 Thinking about purchasing either the epiphone les paul studio or the g-400 next month...i play everything from 50s to the new country, rock, and metal haha..i've played guitar for 20 years and purchased a b.c. rich mockingbird platinum and have relied on it since 1998 for my humbucker tones but want something a bit clearer sounding and a little less beefy...would you suggest the g400 or studio? Gibson is out of the question for price reasons. Thanks ladyguitarpicker! "Brand new Gibson SG given to me for Christmas" . . . that's the most wonderful sentence I've read in a long time! Hope you like the resonator anyway! I had a brand new Gibson SG given to me for Christmas, since I do not play electric guitars I traded it for my resonator guitar. Like reading your reviews. Thanks, and I agree. I have trouble deciding which guitars I like best too! There are so many good ones out there. I have been a guitar fan since the beatles days but till now i still can,t decide which guitars are the best. To me it,s more or less like comparing which one is better Eric Clapton or Tommi Iommi? Any way thanks a lot for your very good article.Love it.